Create easy access points along a water feature by placing flat stones in shallow areas at the edge where the water tends to pool and is not running fast. One of the problems that traditional bird baths and outdoor water features have is that bees and other small pollinators try to perch on the sides and lose their balance. Often their perch is slimy and they slip. Too often under these conditions, bees and other pollinators fall into the water and drown — an unnecessary and sad end for our pollinating friends. Yet, it is easy to provide pollinators a drinking source in our yards. With a very few household materials and in less than five minutes, we can create an attractive “watering hole” for small pollinators. These small creatures don’t need wide expanses of water — but they do require a safe and non-slippery perch from which they can sip water and fly away when their thirst is quenched. • A wide, shallow dish or other vessel that will hold water. Because pollinators are small, short creatures, we want to avoid a deep container. Even a glass pie plate works. • Small rocks or glass marbles to fill the bottom. • Flat stones or other objects that can be set amidst the marbles. These stones will form a perch for the pollinators while they get a drink. • Clean water replaced often that sits slightly below the level of the perch. Imagine you are Ms. Bumblebee and make the distance you would need to lean into the water to get a drink user-friendly. • Cater to the butterflies. 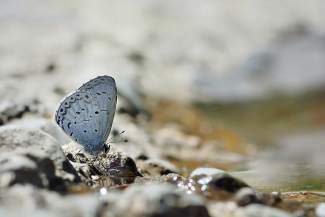 Strange as it sounds, those beautiful butterflies that flit around our gardens drink from muddy puddles. To keep them happy, create some indentations in the soil and fill them with water. • Do you have a birdbath? You can overcome the problem of a steep slope around the edge of the birdbath by adding flat rocks or even a brick that rests slightly above the water line. The rock or brick provides a flat perch where bees and other small pollinators can drink without threat of drowning. • Do you have a water feature? Create easy access points along the water feature by placing flat stones in shallow areas at the edge where the water tends to pool and is not running fast. A low, non-slippery perch at water’s edge is all it takes to make your water feature pollinator-friendly.